Pain in the front of the knee may be caused by Patella Femoral Pain Syndrome (PFPS) - also called chondromalacia, or runner's knee - a condition characterized by a rough or soft spot on the knee cap's cartilage surface. It's caused by over-activity, excess weight and injury. The condition causes pain, giving way, stiffness and a feeling of catching or grinding. Going up and down stairs is difficult, and sitting with your knees bent or squatting is very uncomfortable. Small doses of anti-inflammatory medicines can decrease swelling, stiffness and pain. Other treatments may include cortisone injections, ice, rest and physical therapy. A brace may be recommended to stabilize the knee cap. In rare cases, surgery may be recommended. Though uncomfortable, PFPS is usually a short-term problem and generally does not lead to arthritis or other joint conditions. Nonsurgical options to treat knee pain and limited motion may include medications, injections or physical therapy. In cases where arthritis limits everyday activities, or pain continues while resting, your doctor may recommend knee surgery, including knee replacement. The knee is the most common joint replaced and The Hospital of Central Connecticut offers several options. Surgery, which can be for one or both knees, replaces diseased or damaged parts of the femur (thigh bone), tibia (lower leg bone), and worn cartilage. reflective of the female knee anatomy. For patients whose knees have been only partially affected by osteoarthritis, this surgery uses a smaller incision and enables a quicker return to daily activities. Surgeons at the hospital are also studying the use of "customized" knee replacement, which creates a custom-fitted implant based on MRI study results. Most knee replacement patients begin moving the knee and walking with help the day after surgery and spend no more than five days in the hospital. Recovery varies with each person, but it's important to follow your surgeon's instructions for home care, particularly the exercise program you're given. You will need a walker for three to six weeks, then a cane for another three to six weeks. 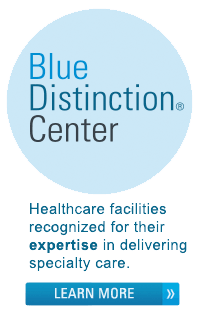 The Hospital of Central Connecticut as been designated a Blue Distinction Center® for hip and knee replacement.